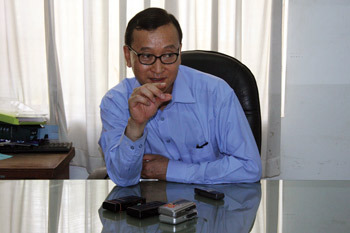 Sam Rainsy speaking to journalist during the press conference at SRP head office in 2009. Embattled opposition leader Sam Rainsy’s position in the National Assembly has been terminated following a string of losses in his long-running legal saga. In a proclamation dated Tuesday, National Assembly President Heng Samrin said Sam Rainsy’s criminal convictions had rendered him ineligible to serve as a lawmaker based on the Kingdom’s Law on the Status of Parliamentarians. “His Excellency Sam Rainsy has completely lost his rights, prerogatives and membership as a parliamentarian of Kampong Cham provincial constituency in the fourth legislative mandate,” the proclamation states. Sam Rainsy, president of the eponymous party, has lived in exile since 2009 to avoid prosecution in connection with a protest he staged in October that year in Svay Rieng province against alleged Vietnamese land encroachment. Earlier this month, the Supreme Court upheld his convictions for incitement and destruction of public property, for which he has been sentenced to two years in prison. He was sentenced to an additional 10 years in prison in September for disinformation and falsifying public documents in connection with evidence he publicised from abroad to vindicate his border claims. Speaking by phone from France, Sam Rainsy said he was untroubled by the proclamation and was confident he had the support of legal experts and the international community. “This shows that power in Cambodia is becoming more and more absolute and more and more illegal,” he said. Despite this grim assessment, however, the opposition leader said he would continue to lead the SRP and predicted that he would be able to return to the Kingdom for the upcoming national elections in 2012 and 2013 via a compromise with the ruling Cambodian People’s Party. “We are not panicking,” he said, adding that the continued attempts to silence him “show the weakness of the CPP”. “They are afraid of Sam Rainsy,” he said. 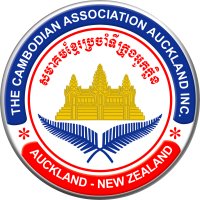 In a statement issued today, Cambodian Centre for Human Rights president Ou Virak said Sam Rainsy’s case “shows how the judiciary and legislature serve the political objectives of the executive”. “The National Assembly lifted Sam Rainsy’s parliamentary immunity in apparent disregard for the constitutional guarantee that immunity will not be removed for opinions expressed in the exercise of one’s duties as a parliamentarian,” Ou Virak said. In a speech earlier this year, Prime Minister Hun Sen announced his intention to “make the opposition group die”.